Pacemaker Press Belfast 02-07-2018: 10 year old Cora Knocker from Belfast pictured in Belfast enjoying the Beautiful weather in Northern Ireland. Picture By: Arthur Allison. Press Eye - Weather Pictures - Portstewart Beach - 30th June 2018 Photograph by Declan Roughan Adrienne Maginness from Belfast. Press Eye - Weather Pictures - Portstewart Beach - 30th June 2018 Photograph by Declan Roughan Katie Shearer and Joshua Reid from Ballyclare. Press Eye - Weather Pictures - Portstewart Beach - 30th June 2018 Photograph by Declan Roughan Joshua aged 9 and mum Tanya McClelland from Lisburn. Press Eye - Weather Pictures - Portstewart Beach - 30th June 2018 Photograph by Declan Roughan Sophia McKillion from Dungannon. Press Eye - Weather Pictures - Portstewart Beach - 30th June 2018 Photograph by Declan Roughan (L-R) Francesca McKillion, Sophia McKillion and Marion McKillion all from Dungannon. Press Eye - Weather Pictures - Portstewart Beach - 30th June 2018 Photograph by Declan Roughan Peter Lawther from Carrickfergus. Press Eye - Weather Pictures - Portstewart Beach - 30th June 2018 Photograph by Declan Roughan Phil Graham from Moira. Press Eye - Weather Pictures - Portstewart Beach - 30th June 2018 Photograph by Declan Roughan (L-R) Anna Mc Cavana aged 11, Sarah Gaw aged 3 and Catherine Gaw aged 11 all from Randalstown. Press Eye - Weather Pictures - Portstewart Beach - 30th June 2018 Photograph by Declan Roughan (L-R) Anna Mc Cavana aged 11 and Catherine Gaw aged 11 from both from Randalstown. Press Eye - Weather Pictures - Portstewart Beach - 30th June 2018 Photograph by Declan Roughan Jarek Stanczak enjoying the sun. Pacemaker Press Belfast 28-06-2018: Northern Ireland weather is to be hot or very hot, perhaps the hottest day on record. The Met Office say the hottest day on record currently stands at 30.8 Celsius. Walkers pictured enjoying the early morning weather in Hazelbank Park near Belfast. Picture By Arthur Allison. Pacemaker Press Belfast 28-06-2018: Northern Ireland weather is to be hot or very hot, perhaps the hottest day on record. The Met Office say the hottest day on record currently stands at 30.8 Celsius. Walkers out enjoying the early morning weather in Hazelbank Park near Belfast. Picture By Arthur Allison. Press Eye - Weather Pictures Botanic Gardens - Belfast - 27th June 2018 Photograph by Declan Roughan (L-R) Lorenzo Rogers Camarena aged 1, Karla Rogers Camatena and Domnic Corra. Press Eye - Weather Pictures Botanic Gardens - Belfast - 27th June 2018 Photograph by Declan Roughan (L-R) Charlie Nesbitt and Georgia Gorman having fun in the sprinkler system. Press Eye - Crawfordsburn Beach - Weather Pictures - 28th May 2018 Photograph by Declan Roughan PHOTOGRAPH TAKEN WITH PARENTAL PERMISSION Aaron Conolly aged 9 from Belfast. Press Eye - Crawfordsburn Beach - Weather Pictures - 28th May 2018 Photograph by Declan Roughan PHOTOGRAPH TAKEN WITH PARENTAL PERMISSION Tom Wade aged 18 months from Belfast. 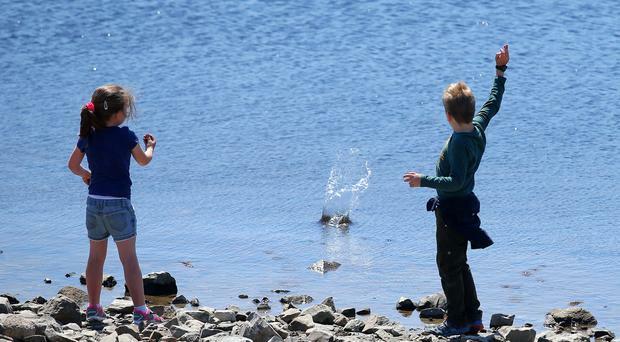 Press Eye - Crawfordsburn Beach - Weather Pictures - 28th May 2018 Photograph by Declan Roughan PHOTOGRAPH TAKEN WITH PARENTAL PERMISSION (L-R) Micah Wylie aged 4 from Belfast and Lucy Boucher aged 5 from Antrim. Press Eye - Crawfordsburn Beach - Weather Pictures - 28th May 2018 Photograph by Declan Roughan (L-R) Sarah Dornan from Belfast, Margaret Mitchell from Belfast and Bobby and Sandra McKay from Holywood. Press Eye - Crawfordsburn Beach - Weather Pictures - 28th May 2018 Photograph by Declan Roughan PHOTOGRAPH TAKEN WITH PARENTAL PERMISSION (L-R) Tara Janssen, Matthew Curliss and Desmond King, all from Belfast. Sunseekers enjoying a beautiful hot sunny day in the grounds of Botanic Gardens in Belfast. Carnew near Katesbridge. Credit: Glynis Herron. You can bring out the sun cream and shades again - because temperatures are set to rise over the weekend. Forecasters say the unsettled weather of the last few days is going to give way to another hot spell. Fraser Ralston of the Met Office said we can expect to enjoy a full week of dry, fine weather. "It's looking pretty good, a dry settled spell is due to set in and that will hold through until at least the middle of next week. "The temperature will slowly nudge up, still quite cool over the next few days but on Sunday you'll see the first signs of warmth, possibly rising to 21 degrees in the Belfast area. "That will slowly continue to climb into Monday and Tuesday and stay in the low 20s, and on Wednesday around the 24 mark could be quite typical over Northern Ireland, with some nice sunshine and the nights will become warmer." If the temperatures do rise to the mid-20s they could again match some parts of France, Italy and even Spain, thanks to warm air arriving from the mid-Atlantic. This will be a welcome change after the strong winds from Storm Hector last week which caused unseasonal damage across the province, downing trees and disrupting travel. The nights will slowly get warmer as well, possibly rising to the mid-teens. "It will be noticeably warmer from Sunday onwards. "It won't be endless sunshine however, but it will be fine weather," added Mr Ralston. The winds will be light, so areas in mid Ulster and Armagh could be the warmest in NI, while areas along Belfast Lough could be a little cooler, but are still expected to be in the early twenties. Today people should be waking up to patchy clouds and some good sunny spells. Moderate northwesterly winds will keep the north coast cool, but the rest of Northern Ireland should feel a shade warmer. Belfast and Lagan Valley will be a shade warmer today, so expect dry and bright weather all day. The better weather is not all good news, however. Those with hay fever will suffer, as pollen counts will be higher as the week continues. Spores from grass pollen will be elevated over the weekend and will gradually rise due to the warmer weather, becoming very high early next week. And of course health officials are warning people to take the usual precautions against the stronger UV rays. The Public Health Agency advises people to use sunscreen with a minimum of factor 15 to help combat the harmful rays and to remember that the sun is at its strongest in the middle of the day, particularly between 11am and 3pm.